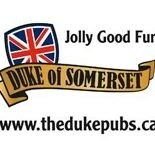 What’s the best thing about the Duke of Somerset? The friendly faces waiting to welcome you and take care of you? How about the fantastic selection of local and imported wines and beer? Our deliciously modern take on pub fare classics? Our amazing streetside patio? Or maybe it’s just that we think your pub experience with us should be nothing short of perfect every time.